Oh y'all!! We had these for breakfast Saturday morning and they were DELICIOUS!! I got the recipe from Pioneer Woman. She said they make 12 muffins, but I made 18 of them. 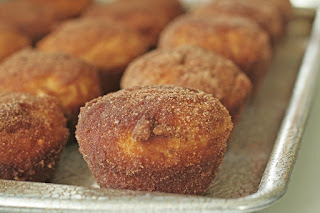 You can click on the link to PWs French Breakfast Puffs to see her exact recipe. Below it is written with a few changes I made. Preheat oven to 350 degrees. Lightly grease 18 muffin cups. Stir together flour, baking powder, salt, and nutmeg. Set aside. In a different bowl, cream together 1 cup sugar and shortening, then add eggs and mix. Add flour mixture and milk alternately to creamed mixture, beating well after each addition. Fill prepared muffin cups 1/2 full. Bake at 350 for 20-25 minutes or until golden. In a bowl, melt 2 sticks butter. In a separate bowl combine remaining sugar and cinnamon. Dip baked muffins in butter, coating thoroughly, then coat with cinnamon-sugar mixture. We found that these tasted BETTER after they had cooled for about an hour. I am sure y'all will enjoy them, too! Happy eating!! Oh my goodness! Those look so very, very delicious. I will have to give them a try this weekend. Thanks for sharing the recipe! Yum! I'll have to try these! Thank you for these yummy-sounding muffins (recipe)! They would be even better if they had no calories in them - ha! If you enjoy inspiring Christmas stories this season, stop by. I am posting them throughout the month. Today's made #4. These looks just delicious. Our customers would just love them. Excuse me.... what month is it???? $5 Gift Certificate from Adagio!! !